I bought this for my little boy when he was born as his “coming home from hospital” outfit. It didn’t quite work out that way… it was way too big! So he had to wear something else. But when he eventually did grow into it, I had him in this loads! 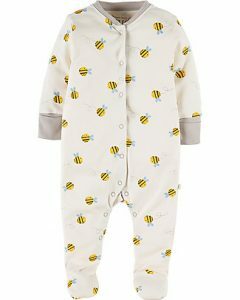 Made from 100% organic cotton interlock making it both super soft and durable, this babygrow is fully poppered for ease of changing. With integrated scratch mitts and cosy lined feet. I laugh in the face of #BlueMonday!